I don't trust MS Update website and would prefer to install the updates manually. At this stage there are not too many of them so it should be easy to do. Can someone please confirm that my procedure is correct, I have never used MS Update Catalog before. So I only need to monitor updates after 2017-Nov-15 on MS Update Catalog website and RyanVM forums. b) is it only necessary to monitor WES09, POSReady 2009 and Windows XP Embedded or is some other category also needed, like Windows Server 2003 or 2008? 2) Monitor change logs on RyanVM forums for the three packages listed above. 3) Download relevant kb exe files and install them one by one. If there is more than one file available then the installation order might be important, in that case I'll just bring this up on this thread, I guess. 4) I might later install Excel from MS Office Home and Student 2007, is it possible to run it without any MSO updates? POSReady updates must be first enabled in the registry, otherwise KB setup error will pop-up. Disclaimer: I use Linux Lite, Arch Linux and Debian for everyday tasks and only need XP to run a few specialized Windows applications. Updated to 20171222. Please read the Changelog for full details. Hi 5eraph: I uploaded your new file 12/22/17, Thank You Again for all that you do. PS: Have a Merry Christmas and a Great New Year. i dont want to be a pain.. thought i'd ask..
will there be any POSReady addon or IE8 addon this month ? thanks in advance for reply..
Want to wait for Microsoft to unblock KB4056892 (a Win10 update), which includes a microcode update for modern microprocessors to mitigate the Meltdown and Spectre vulnerabilities. KB4056615 for POSReady may include the same microcode update, as the update package includes processor-specific kernel files. It would be nice to have a bug-free update. And considering Atari800xl's issue with this update, I'd like to err on the side of caution. RAPTOR .. just makes you want to smile! XP can take full advantage of an SSD... All we really need is a good, free utility that sits in the taskbar and automatically runs TRIM whenever necessary. You can BOOT from this drive? Are you running XP? Is there such a thing, for XP? Thats not needed for modern ssd as they can trim themselves automatically ! Did have win 7 on it.. but now running win 10 on it..
No waiting about though lol..
KB4057893 - A security issue has been identified in a Microsoft software product that could affect your system. You can help protect your system by installing this update from Microsoft. KB4074852 - A security issue has been identified in a Microsoft software product that could affect your system. I can no longer access the Windows Update site for XP with IE. Anyone else seeing this? I just noticed the problem occurs if IE tries to access the site with http. If you use https, the website GUI appears like it did before with http. I guess MS has made some changes there. thanks in advance for an answer..
i think they will make a new one sooner or later. just a question how you meke these addons? im interested of create my own using the latest updates. Hi 5eraph , can we get a update of this add-on with exclusion of broken oleaut and NTFS driver? its looking quite sad for xp updated addons..
none for last few months..
hope some one can prove me wrong..
Would there be a good reason to not include those updates even if have a genuine xp version and licence ? i wonder if there can be some trick so windows thinks it already has them installed. i bet the addon makers waiting for newer versions of those kb updates. cant see any newer versions coming out any time soon..
can only hold your breath and wait i suppose.. I updated this update pack for my own need. Can I post it ? It's up to you, Dibya, but I'll be releasing another addon soon to supersede it. If you do post your addon, create a new thread for it. I'll look into those, specifically. What do they break? @5eraph, if you do searches over at MSFN for KB4056615 and KB4074852, you will quickly find many posts explaining where several different things are broken by those two updates, both OS functions and some third-party programs, specifically by the "updated" versions of NTFS.sys in KB4056615 and oleaut32.dll in KB4074852. If you are interested, heinoganda offers patched versions of those two updates which includes the last fully working versions of the offending files and satisfies MU. [ I'm not sure if the resulting installs pass SFC, but the problems created by the two problem updates no longer occur.] You can get copies of the patched updates if you PM heinoganda. AFAIK, if MS ever does release a legitimate fix for either or both of these issues, it should install correctly over the patched files without problem. For experimental users I have modified KB4056615 and KB4074852. For KB4056615, the original NTFS.sys (The version was changed from 5.1.2600.5512 to 5.1.2600.7392) file was implemented, as well for KB4074852 the file oleaut32.dll (The version was changed from 5.1.2600.7248 to 5.1.2600.7424) and KB4018556-v2.CAT (name adapted to KB4018556-v2x.CAT) copied from KB4018556-v2. Available for the Windows language version ENU, DEU, ESN, FRA, ITA, NLD, PTB, PTG, CSY, DAN, ELL, FIN, HUN, NOR, PLK, RUS and SVE. 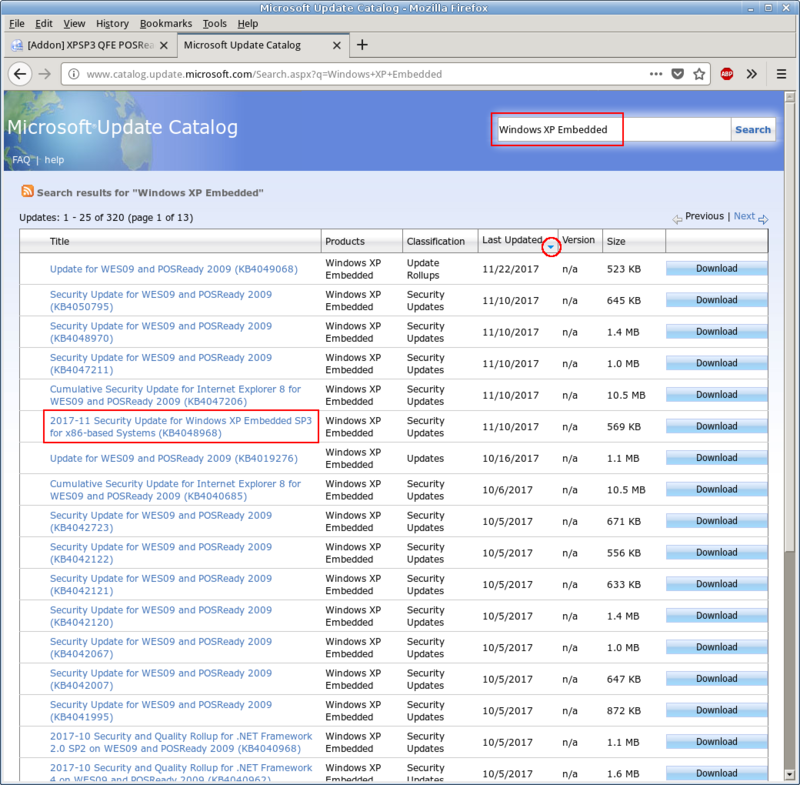 AU, WU and MU are no longer offered after the installation of the modified updates KB4056615 and KB4074852. Before installation, the two original must be uninstalled before! If interested, send me a PM. Making progress. What follows is what I have determined so far. Bear in mind that these changes apply to the addons, and not necessarily to other updates released this year by Microsoft. KB4101864 replaces KB969262uh and KB4018490. Flash Player will be updated. The updates are downloaded and extracted, Individual update INFs created and finalized. Just need to merge them with the addons and test. But that will have to wait until tomorrow. KB4074852 = superbad!!!! heinoganda recently validated it was best to use the KB4018556-v2. My personal exsperience is to stay away from the newer KB4074852. I haven't experienced any problems with a clean setup that included the "superbad" KB4074852, which is definitely *NOT* to say that I don't take you (and Henoganda) seriously. What are some of the things that go wrong with it? Are there any "repeatable" test scenarios? Typo fixed, GH0st. Thank you. Forgot to update the VM before compiling the list (VM from October 2017). The other updates are still valid though. 1. I installed WinXP on a virtual PC (XPSP3_QFE_UpdatePack_20171010 + XPSP3_QFE_POSReady_Addon_20171222_5er). 2. I installed ΙΕ8 update (ie8-windowsxp-kb4092946-x86-embedded-enu). 3. I updated with all the updates from MU (included the KB4074852). You will have to go thru the threads at MSFN to get the full scoop and why so many people have had issues, that Henoganda made a *FIXED* version, which also did not work for me, so I avoid it fully. But the one thing I noticed was trying to go to SERVICES.msc ... error! There were other weirdnesses too which I did not take the time to validate. This (services.msc issue) caused me to uninstall that update. Let me know if yours affected! I have no problem with services.msc. Now I install the Office 2003 + Compatibility Pack. ...the one thing I noticed was trying to go to SERVICES.msc ... error! Thanks for your reply. I knew about the MSFN thread, but I was interested in some specific problems you might have with the update. If there are other things to check, please let me know. I will keep the update in my OnePiece addon for now. GH0st ... I have no problem with services.msc. Now I install the Office 2003 + Compatibility Pack. Good regarding services.msc. 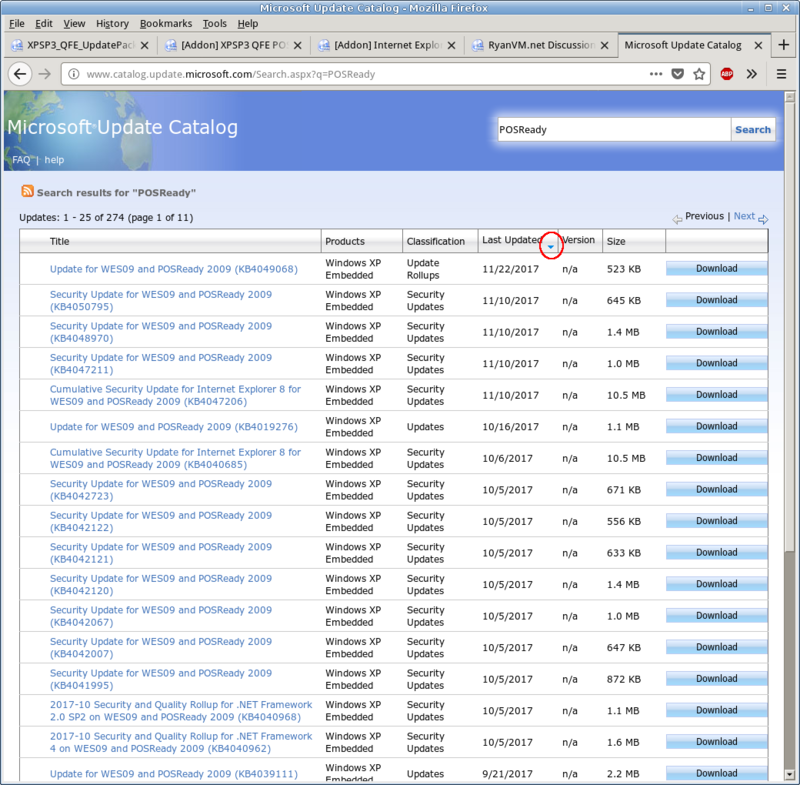 Somewhere here I have posted the hotfixes you need to install MANUALLY (not thru WU) and of coarse you will need them downloaded with the latest IE8 cumulative update. For now install Office 2003 and let it get all the updates thru WU it wants, multiple installs and reboots needed. But do not install the compatibility pack yet, till I find that post for you. Edit to add: These updates need to made manually, NOT thru WU, then install IE8 update again, reboot. Last edited by GH0st on Fri Apr 13, 2018 12:27 pm, edited 1 time in total. Thanks for your reply. I knew about the MSFN thread, but I was interested in some specific problems you might have with the update. For me, no (obvious) errors, services.msc is working ... If there are other things to check, please let me know. I will keep the update in my OnePiece addon for now. 1. Office 2003 + Office Compatibility Pack + all updates from MU. 3. .Net 1 - 4 (dotNetFx_AIO_x86_20180111). 4. VCredist 2005 - 2017. *** In Office 2003 iso, I have integrated sp3 and updates until 2014. I use "Big Pack Runtime Libraries by Wilenty 2018-03-24", does a great job with all the extra C++ and other stuff included there. So for me, XP slipped with uSP4, WinXP Post uSP4 Hotfix Installer, abbodi AIO_dotNet, Big Pack Runtime Libraries by Wilenty, WinXP Enhanced Security Options guide. This makes for a fast and clean install! first trip to WU offers only KB4074852 ... which I avoid! I tried "Big Pack Runtime Libraries by Wilenty" and works well. In the final installation I will try your "Enhanced Security Options".